In problem-solving organizations, some tasks are repetitive, resulting from ongoing operations. Others are one-of-a-kind, and directly related to the organizational mission. And there are other tasks, one-of-a-kind or not, that relate to infrastructure and affect wide segments of the organizational population. 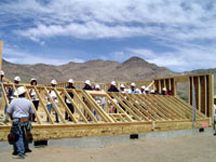 A team raises a wall of a new home in Nevada sponsored by the U.S. Department of Housing and Urban Development, in an echo of an old-fashioned barn raising. Photo courtesy U.S. Department of Housing and Urban Development. Tasks of this last category can be addressed using an organizational form similar to a "barn raising" — a custom from the early history of U.S. farm communities, where community efforts were applied to the benefit of single farm families. In "Workplace Barn Raisings," Point Lookout for August 2, 2006, we surveyed the kinds of tasks that modern organizations can tackle as barn raisings. Here are some ways "barn raisers" can divide the work. Whether you're raising a real barn or a figurative barn, you have to plan, and someone has to take the lead. Think of your barn raising as if it were a real project. It is. In traditional barn raisings, community members did "winter work" to prepare for the event, on their own farms, during the winter. They harvested timber, hewed beams, made pegs, and sharpened tools. In a modern barn raising people do figurative "winter work" on their own well in advance. In moving a library, for example, they can label boxes or locate sources of dollies. Real barns need foundations and floors. And some of the work on the heavy timbers has to be done after they arrive on site. In real barn raisings, we do this kind of work on site in advance of the event. Some of the work for your barn raising must be done in place, in the weeks leading up to the event. In our library example, labeling the bookshelves and installing dolly ramps might be examples of site prep work. In a real barn raising, food preparation is in the last-day category, but there are lots of other items, like preparing to look after children and farm animals during all the ruckus. In a modern barn raising, the effort itself might have consequences internally, or with customers or ongoing use of the event site. You probably need to deal with these issues starting the day before the event. In both traditional and figurative barn raisings, the celebration and sharing are part of the fun, and much of the benefit. Provide food and drink, scheduled breaks, comfortable places to rest, and a party afterwards. When we lived in Montpelier, Vermont, they wanted to move the library. They asked everyone in town to check out some books from the old library and return them to the new library. Don't remember how well it worked. Would you like to see your comments posted here? rbreniFZCDxNHvcEJXmxFner@ChacLeuhIpDZrLekLfMWoCanyon.comSend me your comments by email, or by Web form. I offer email and telephone coaching at both corporate and individual rates. Contact Rick for details at rbrenwCcNHoXZJEHCrxxLner@ChacqPeUuvLBFUCyrEeUoCanyon.com or (650) 787-6475, or toll-free in the continental US at (866) 378-5470.